New York City skyline from the Williamsburg Bridge on the Brooklyn side. Ugly Domino Sugar factory in right foreground after the ugly white concrete part was torn down. Matching building which is Domino Sugar Building. 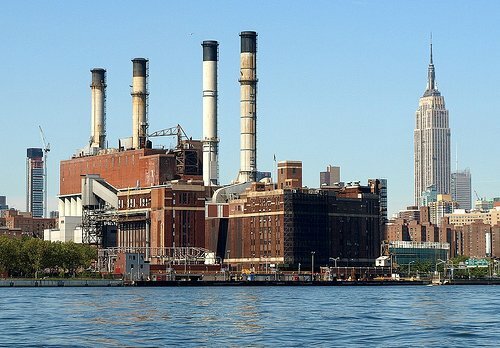 Across the East River you can see the smokestack chimneys of the Con Edison Power Plant. Domino Plant after concrete building taken down.